Yes readers, this picture looks familiar; an author proudly smiling and holding his/her recently published book . 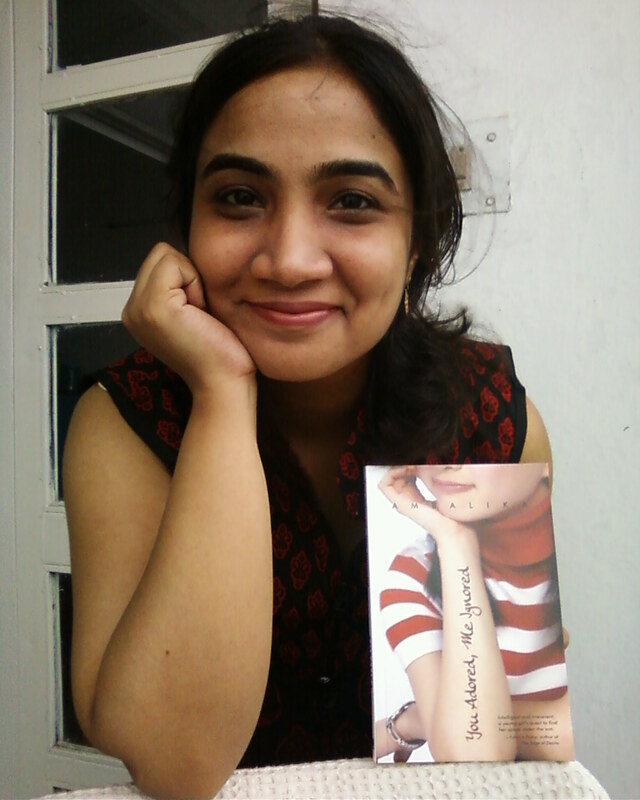 Ambalika Bhatacharyya – author of YAMI is our latest feature for author’s corner. You may finish reading her book over a weekend, but unlike a Chennai Express this author is here to stay for long…The melon editors get candid with this bubbly and energetic author. Read on …. E: First of all tell us why and how did this book happen? A: I have always been writing, whether going through good times or bad. But I was going through a particularly bad time in life. I was shaken and tested at each and everything that I tried to do or wanted to do. Absolutely nothing went right. of course I didn’t like it. but neither did I know how to end it. The only thing I could come up with was to write it. I thought if I wrote it down and lead the character to some logical end, perhaps I may also find the solution to the problems in my life. E: So that was the main motivation to want to write, You Adored, Me Ignored? A: Now when I look back at those trying times, I feel that it was the Universe’s way of bringing me on the track to writing this book. It was always something that I wanted to do but had no idea how or on what I would do it. The universe facilitated it and I am very grateful for that. After seeing the book through from its conception to being out in the hands of the reader, all I can say is that this book was destined to happen. Its one of those Universe Conspiring thing at play. E: How easy or difficult was it to get published? A: Oh, getting the publisher was nothing short of a fairy tale! As is now known, YAMI is a very small book. In terms of the word count, it does not meet the basic criteria for almost all of the publishers. So I did not have many options to begin with. My only hope was to try Wisdom Tree. They seemed very open about new kind of stories and did not appear fussy. I befriended them on Facebook and asked them if they would like to give my little story a chance. They did. And rest, as they say, is history. Again, it was like one of those ‘universe conspiring’ things. E: What were your first reactions on getting your book published? And what about your family, friends and collegues. How did they take it? A: I still remember that afternoon when I got the news. At that time I was an Assistant Professor and we were having a lab session. It was a holiday and I showed up very grudgingly. So after dilly dallying around the students for a while, when I logged onto to check my mails, I was in for the most pleasant shock of my life! There was this mail from the then editor who wrote in to say that they liked the manuscript and are looking forward to working on it! I was so shocked that I didn’t say it to anybody for a long time but would keep flushing beetroot whenever I thought about it. When I finally came clean , there were exciting reactions. My brother was in shock. A greater shock was when I told him that he figures in the book in a not so flattering role. Sister in law was always sure I was going to end up this way, so she was happy it finally happened and I could sense my parents beam over the phone when they enquired of it. But none have managed to read it completely till now. My friends came to know about it only when I announced the release of the book. So they were a little puzzled if I was indeed talking about my own work! To my colleagues, I have said nothing of it. We all sit in various locations of the country and have never even seen each other. Under the circumstances it would be very odd for me to go and talk about it. So I have left it to them discovering it for themselves. E: Who/ what inpires your writing? s also the best piece of advice I have ever received – stay open to everything and everyone and you will never know how and when you got hit by inspiration! I have picked up story ideas under most unremarkable circumstances. Most recently, it’s a jazzily written cook book that inspiring me to both improve my cooking as well as writing, hee! E: Tell us about your writing process. Or would you call yourself a spontaneous author? So.. back to answering your question.. well, that is one area that I have to pay more attention to. As of now , unless I can see the plot unfolding inside my head and hear my characters converse I am unable to frame the story line and write. That is a very psychic approach to writing. It works perfectly, when I have spells of such ‘story visions’. But the flip side is, sometimes they don’t happen in any sequence and that throws the writing totally off the track. So the end result is a story that leads to nothing. A very disturbing thing to happen. So I need to bring in some ‘order and method’ into it, as Hercule Poirot and Sherlock Homles would say. E: Is there a particular genre that you are more inclined to read or write? How would you describe your writing style? A: No, I am very open to reading in all genres and in writing, so long as I have a story that appeals to me , that’s all that matters. However, in both reading and writing, I prefer the matter to be well written, structured, honest , creative and humourous. My writing style is also along these lines. This forms the foundation. Now, I have to work on making it grow from there. E:You have been a IT professional and still have a full time job. So when does writing happen? Tell us more about this balancing task. A: It doesn’t happen. That is the truth. The closest I get to active writing is when ,by some turn of luck I have a three day weekend and I get one solid day to break free from all the clutter of office and domestic chores. Other times, I attempt passive writing, which is observing life and writing inside the head and scribbling quickly an idea or whatever before I forget it. But there are times when even that is not possible. I am mentally exhausted to do any creative thinking. It also depends on the kind of job one has. As an Assistant Professor- which is when I wrote YAMI- I was better placed to do writing on Sunday afternoons. So I could follow that schedule. But with companies, it is a totally different scenario. It was still better earlier when I was with the training section. Even though the quality of my Sunday afternoon writing were not satisfactory by my own standard, at least I could do it. But now with a change of role to Pre Sales, I am yet to figure a schedule. Add to that a move to a new city and adjusting to life. Writing is also a job and when I cannot do it as per my liking, I prefer not to do it but then if I do not do it at all, I feel suffocated. Nevertheless, I still try to attempt a few hundred words of between groceries, cooking, laundry and pre sales activities. E:Tell us about your favourite books and work that has inspired you in the recent past. A: The works of Terry Pratchet, James Thurber, Wodehouse, Jerome K. Jerome, Agatha Christie and Arthur C Doyle are my all time favorites. But apart from Terry Pratchett, none of the others are around to write more stuff. So I should look else where. But, when it comes to fiction, I am a little reluctant to go beyond this. And I don’t mind reading their works over and again. Among the classic writers, I like to read Kipling, Oscar Wilde and Jim Corbett. The scene is better on the non fiction side- with well written books on Afghanistanand by foreigners on their journey in India, topping the list. E: And is your writing anyway inspired by what you read? A: Oh yes, definitely! Neither I nor my writing would be anything without the books I have read and the imaginary conversations I have with their writers and characters. E: Your book is about a 24 year old girl who stands apart in a family brimming with intellectuals and high expectations of parents from their kids, So is there a bit of Anam in you? A: Goodness! That question is going to let the cat out of the bag!!! Yes, indeed Anam is me in entirety , not in bits. E: What is your advice to youngsters who find themselves in similar set up of heightened family expectations and never ending comparisons like Anam? A: Given the kind of times we live in, its’ very easy to get carried away, be impressed quickly and lose sight of our own selves. Unfortunately, none of these lead to ‘living’. It is just ‘carrying on with life’. Unless you stand up for yourself , no one else will. And when you do, you will find that, more often than not, there aren’t many to support you. So you have to be your own best friend, have tremendous belief in yourself and keep going positively. Trust me, this is much more difficult than beating competition. Because in beating competition, you can always find ways to be one up. But that’s an energy sapping exercise, leading to nothing wonderful. The best way is to ignore any kind of competition and just do your own stuff. In time, it will lead to good things. So, comparisons or no comparisons, youngsters need to be assertive, decisive and devote time in connecting with themselves so that they get some clue about where they really want to head toward in life. And yes, having an elaborate dose of humor is also recommended! Other wise, when the going gets messy, it will get even murkier! E: Tell us what do you think about writersmelon and this initiative called authors corner? What are we getting to read from you here? A: It is a wonderful medium through which authors can build their online presence and showcase their writing. Prospective readers can get an idea about the author and the author’s writing even before they get the book. Like I keep telling you, Thank you for existing. As to what readers are going to get to read from me—hmm…, well, it would be a combination of anecdotes from my life that somehow find a relevance at the moment and some of the talking points in YAMI. For details, it would be better to read the section! E: Plans and preparations for the next book? A: Oh yes, in fact many of them! In fact, they have been already written. But before it gets beyond that, I would like to focus on this one. Its just out and I don’t think it has faced the world enough yet. And knowing Anam, I know that no one else will be able to help her in that , than the way I can! She should get some experience of the world of readers so that when future characters come in, she can guide them for me. I can sit back and relax.